For those of you who don’t know the first thing about Ireland, it’s cold. Even if the sun is shining with out a cloud in the sky, the wind can cut through you like a knife and it could rain or hail at the drop of a hat. The only thing more confusing than Irish weather is American tax law. I bring up the subject of social norms because upon my arrival to Dublin, I asked a native Dubliner for suggestions on where to get a good pint of Guinness. Guinness is one of those beers that is easily screwed up, it needs to be kept at a certain temperature and the bar keep must use the two part pour technique to ensure the full flavor of the stout is attained. (These facts are truths you can only appreciate when in Ireland) So my newly found Irish friend points me in the direction of several pubs in Dublin and one of those is called The Porterhouse. Now normally I wouldn’t add the name of an establishment that gives me poor service or in this case that refuses me service but I found out that it was MY fault and not theirs. Here is where knowing the social norms of the area you are in comes in handy. Dublin has a problem with heroin/drug addicts. These people live on the streets and roam them as if they owned the town and they aren’t accepted as much as they are tolerated. People from Dublin just walk past them and do so as quickly as possible. Visitors to dublin barely recognize them because they look much like anyone else except one simple detail. They wear beanies and hooded sweatshirts all the time, and they wear them with their hoods up, much like me in the picture above. The Irish have some how built up a tolerance to the cold so most of them do not wear anything on their head, though it is very common for men to wear scarfs and a jacket. Being from a very warm climate in San Antonio Texas, I find it hard to leave my head to the elements so I was never without my beanie and hoodie. So one night a friend of Brownie’s took us out to have a pint of beer at some of the pubs in the city center. The last pub we went to was going to be the Porterhouse. I had managed to get into every pub, restaurant and shopping mall in the city up to this point but this pub had a doorman that wasn’t nearly as observant as the previous door guys. Our friend, his girlfriend and Brownie walked right in. I stopped just in front of the door to read the sign outside the door that listed off the specials for the night. When I tried to follow my group in, the doorman slid right in front of me. At first I was just annoyed that he got in my way and that he got really close to me, he invaded my “bubble” so-to-speak. My first reaction was to say excuse me and try to go around the guy, thinking maybe he was moving that direction and I hadn’t noticed. That’s when he told me I couldn’t go in. He said “You can’t go in there dressed like that.” With my jaw on the ground I pulled my hoods off my head, stood up straight and look at him like he was crazy and said “like what, and American?” Thinking that he had something against Americans, now how he would have guessed I was an American by just looking at me is beyond me but I’ve had somewhat of a complex about being American since I started traveling. He said “No, just think about the way you’re dressed, you’ve got to look decent when you go into a place like this.” Please look at the picture above and explain to me what about my appearance looks indecent? Ok, never mind don’t tell me because I can’t and won’t see it because in my society, I looked “normal” for a guy that was freezing his tail off. Since I had no response and I didn’t know if this place had some sort of dress code that I was breaking, I turned around and walked off leaving my group inside the pub. My wife quickly left and asked me what had happened and this is the point in which I started to get insulted and no longer wanted go into the pub after all. Our friends and my brother in laws did tell me later that I looked much like the people the Dubliners call “knockers” which are the drug attics. Before my trip to Europe, I lost nearly 50 pounds so I am skinny, pale and needed more than the average amount of clothing to keep me warm. While none of this mattered much to me at the time, I do realize the guy was just trying to keep the dirt bags out of the pub which essentially is the job of a doorman. If I had known what social norms I was breaking before I went to the pub, I might have been able to try some of the beers there, so the lesson here is “while it is ok to be yourself at home, you must try to “fit in” in new places if you want to go where the locals go. 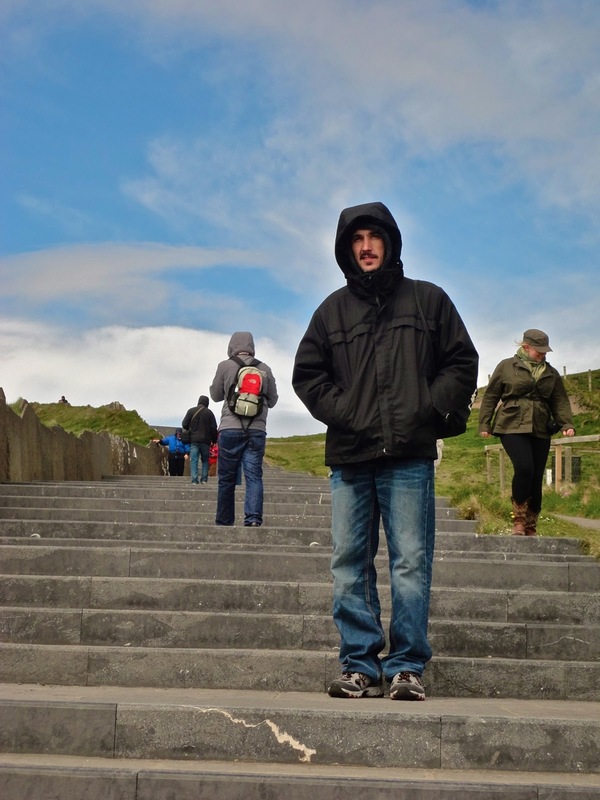 So if you ever go to Dublin, remember… No beanies and keep your hoods off your head. So who wants to learn how to travel? I am an American living abroad, and by abroad I mean pretty much anywhere that isn't the United States. Not because of some political boycott or legal issues but because this planet is very big and there is more to see than what's in my backyard. I am recently relocated from Egypt to Ecuador where I blog and work on a few online projects that I hope to be nearly as successful as every other aspect of my life.